I had already shown my 4 year old son a Bible story book and he had refused to even open it, so I was not sure how this would be received. He loves it though and is pleased to have his own Bible. The stories are very short and the pictures bright and cheerful. I like the guide book as it extends the exercise and also reminds me to pray at the beginning and the end. My son likes the bright stickers. He's always happy to read a new Bible story every day, and that makes me very happy too. My 5 years old daughter loves the book, the guidebook is easy to follow and the stickers are bonus, she always can't wait to do that! My three year loves doing her Bible study everyday and is particularly keen on the sticker! I am intending to work our way through all three books and then repeat each book (great that you can buy spare sticker sets) and include the 'snack for the journey' section to extend it the secon time around. A really helpful way of conducting bible study with our little girl. I wanted some way of having my husband and I share the gospel with her and we decided to use this guide and actually we are really enjoying doing this every sunday evening after dinner. Our daughter also loves this lesson and one morning woke up saying 'I dreamt of beginning with God!' She also loves the stickers aspect so that's the fun thing for her to do. I wholeheartedly support parents if you want a fun way of introducing a conversation about the gospel with your little ones. This booklet is great - the content is good, the stickers are fun and there is useful purpose statement for each Bible Story that you can get to with your child. We used it with our 5 year old, but really it is too young for him - probably best pitched for a 3 or 4 year old. I have recently started using this with my three and a half year old son and it works very well for our morning 'quiet time'. It can be done in quite a short time but there are ideas for lengthening it. It is very focused in the message being reinforced each day. My son enjoys the different hand positions for different types of prayers, as well as enjoying the sticker, of course! It has given me lots of ideas that can be transferred to different situations (e.g. toddler group story time etc). My wife & I have thoroughly enjoyed opening up God's word through this material. My daughter looks forward to hearing about new things in the bible as well as finding the sticker. 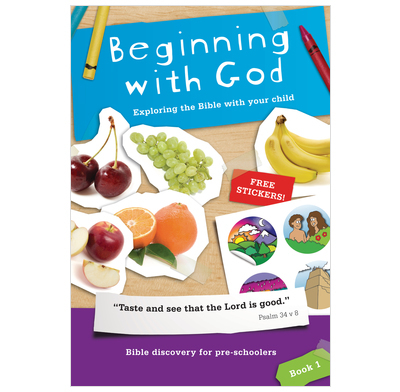 This is an excellent resource to bring God's truths to very young children.